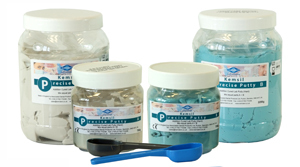 Kemsil Precise is a revolutionary new easy to use addition-cured lab putty. Dental Technicians already appreciate how versatile and useful lab putty can be. Kemdent have made it quick and easy to use by offering the latest technology in a simple way. It is so easy to prepare and use that we call it childs play! You simply mix equal parts of Kemsil A + B to produce probably the best lab putty you have ever used! The benefits do not stop with the mixing and preparation. The technology used in Kemsil Precise lab putty offers even greater accuracy, with up to 70% less shrinkage than conventional condensation-cured putties. Production of copy denture moulds.